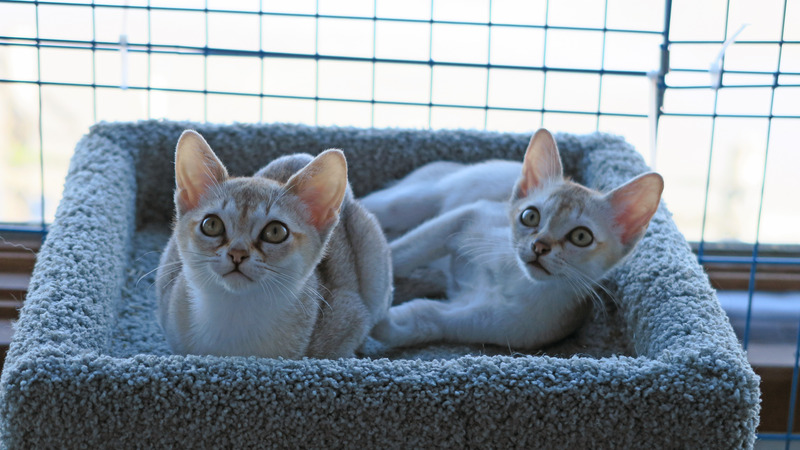 Some pictures from a quick day trip to pick up two kittens from Canada. We left at 5am on 3/27/2015. 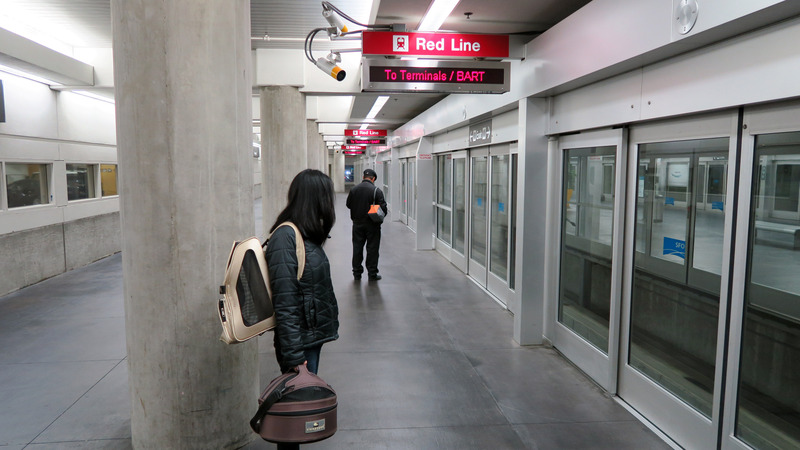 We like to park in "International Parking" at SFO and take the "Air Train" to the terminal, below you see Katherine holding two kitten carriers waiting for the Air Train. We will be back in this spot in about 12 hours (at 5pm). 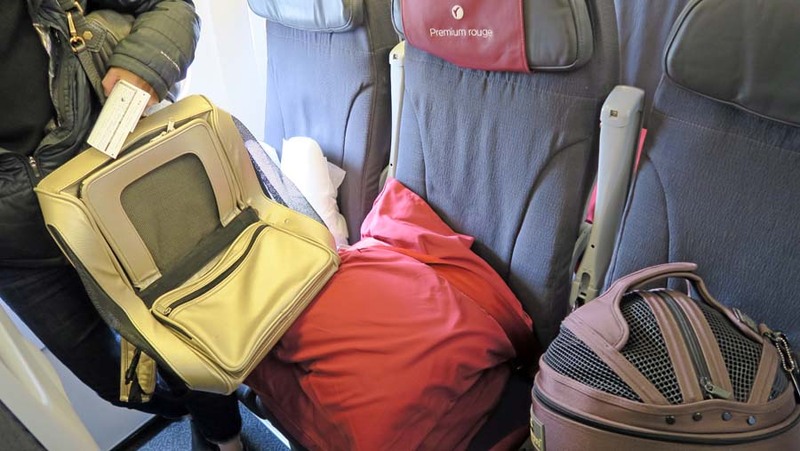 "Air Canada Rouge" is LAME - the "first class" seating is three coach seats with some cushions pushed in the middle seat. 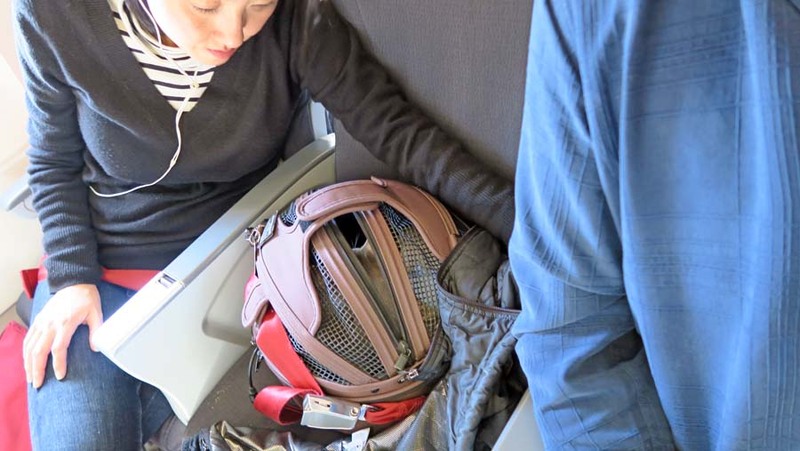 So it is the same as "coach", but making sure nobody is sitting in a middle seat. 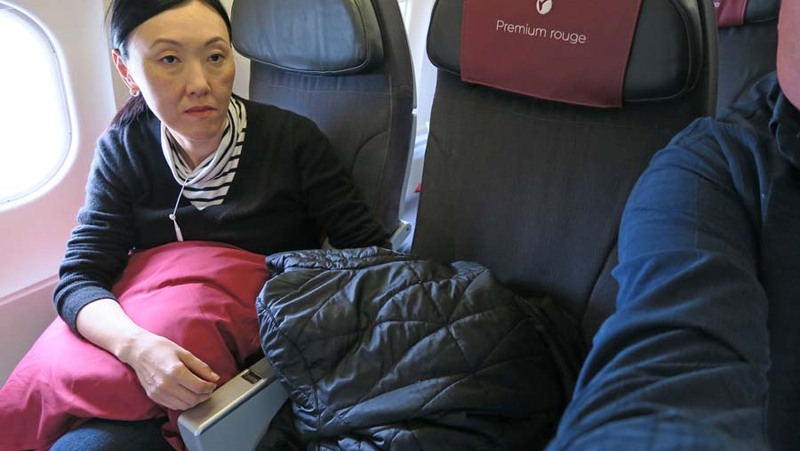 Here we are - the "red pillows" in the middle seat makes sure nobody sits there. Which is fine with Katherine since she usually takes all the pillows and uses it to rest her head against the window and give her back some lumbar support. 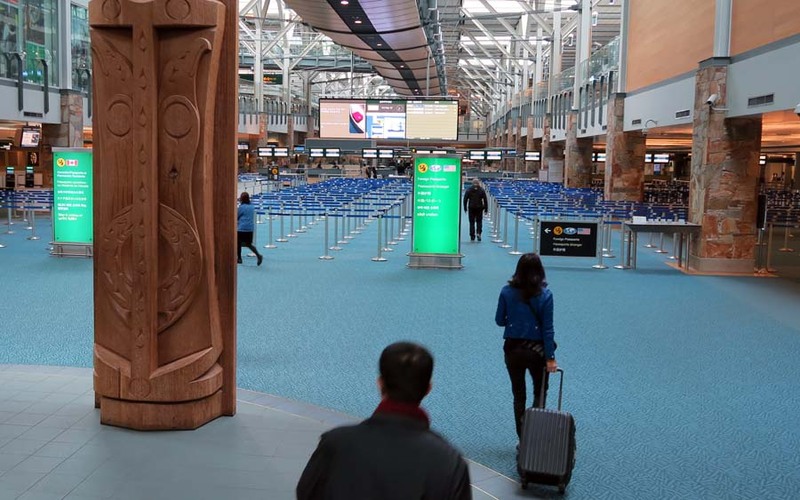 Here we are arriving into YVR international airport in Vancouver Canada. 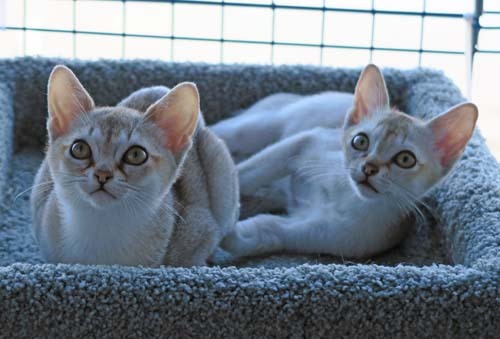 We arrive at the "Cattery" (where they breed these purebred Singapura cats) of Jana Baldwin in Vancouver Canada. 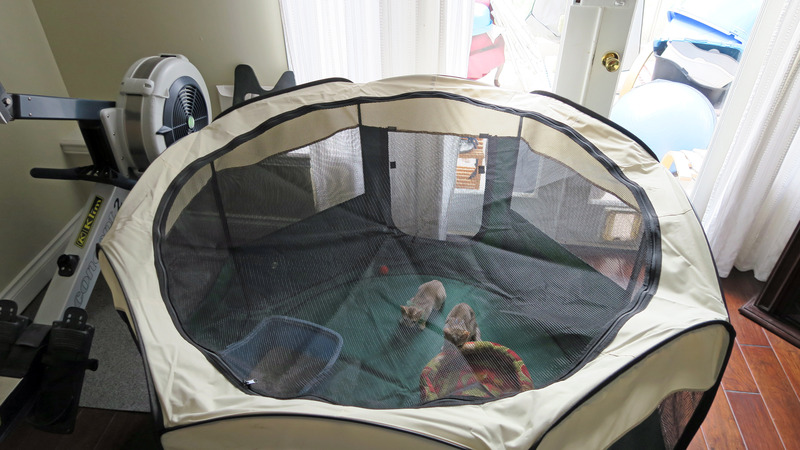 In the picture below, our two kittens have been separated out and prepared for us in the little tent. We took a little tour of the cattery, here is a mommy kitty with three TINY little babies in a birthing room. The mommy kitty was very affectionate and would rub against our fingers or against the cage but she was vocal and made small growling noises when we were too close to her babies. Also notice that there are only 3 kittens in this litter. 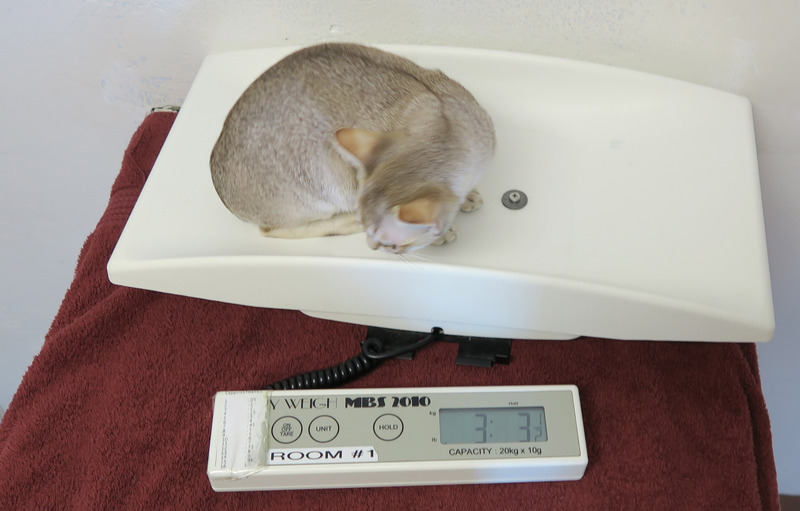 Because full-grown Singapuras are such a small-sized cat, they tend to have very small litters. 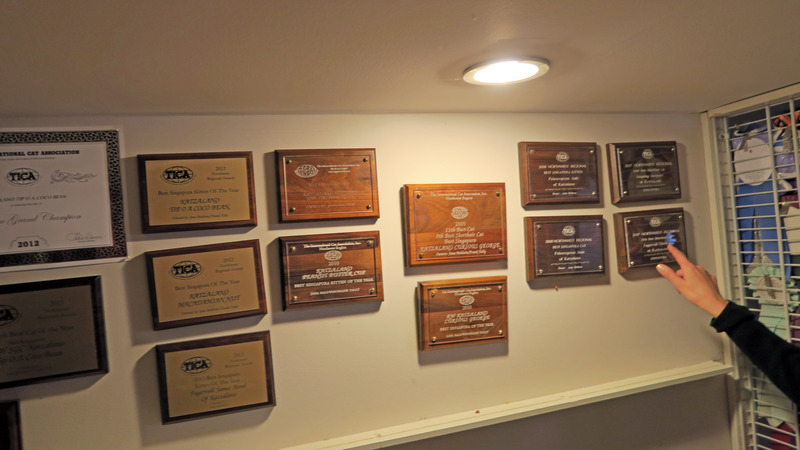 Jana Baldwin displays some of her many awards on a wall in the cattery. 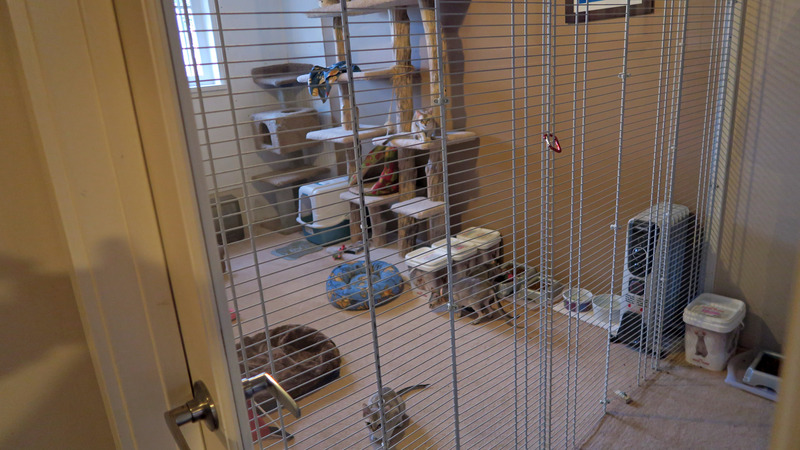 We're behind a glass door, and looking into a room with some other cats. We are looking at a room full of all-girls. 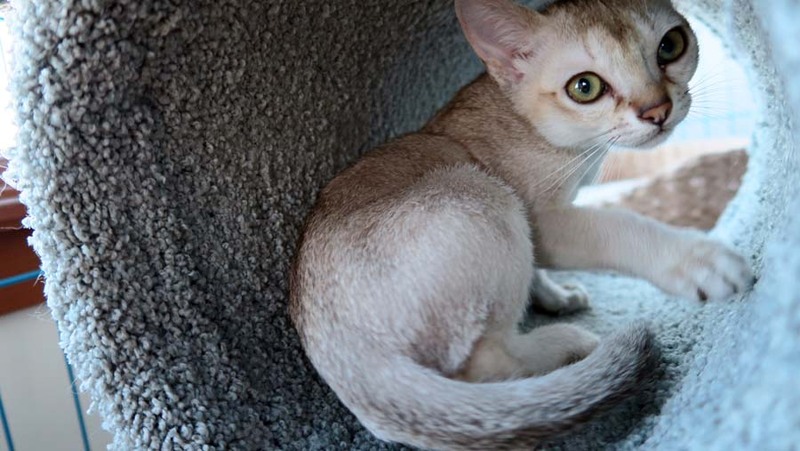 The Singapura breed likes to climb. 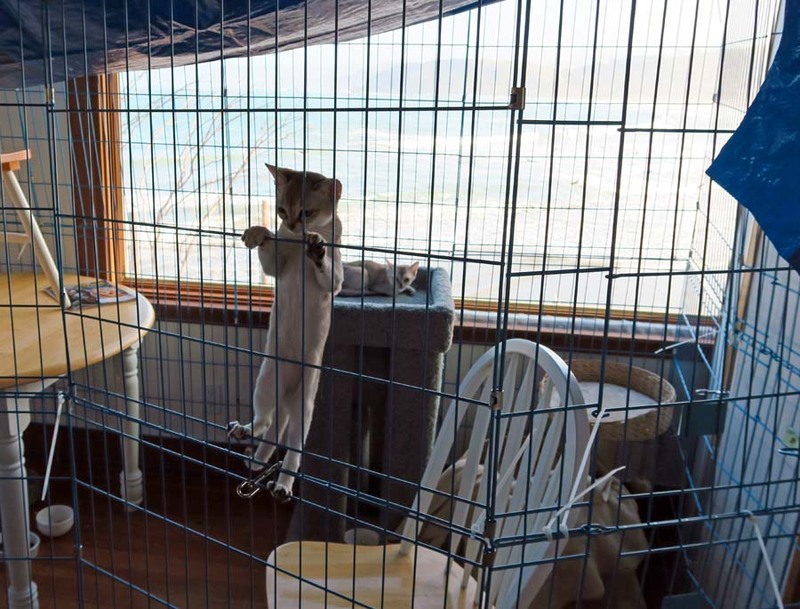 Here's one of the cats climbing the wire fence separating the 2 rooms. People will sometimes refer to the Singapuras as "little monkeys." 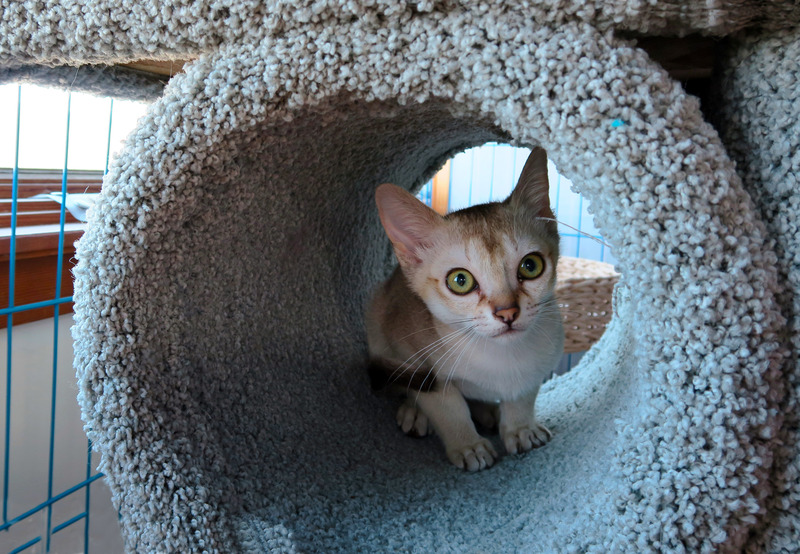 It's also hard to tell, but this climbing Singapura is a full or half-sibling to our kittens. Katherine is holding and meeting "Bentley" for the first time. We adopted "Bentley" and "Cooper" from Jana Baldwin. Bentley and Cooper both share the same father who is "Fagervoll James Bond of Katzalano". Bentley's mother is: "Katzalano I Love Lucy" and Cooper's mother is "Katzalano See Forever Eyes" aka Ava. Bentley was born on December 9th, 2014 and Cooper was born on December 14, 2014. AND..... back on Air Canada an hour later on the way home. A very tired Katherine on the left, and the cats are in the seat between us (seat belted into the airplane in a car carrier). 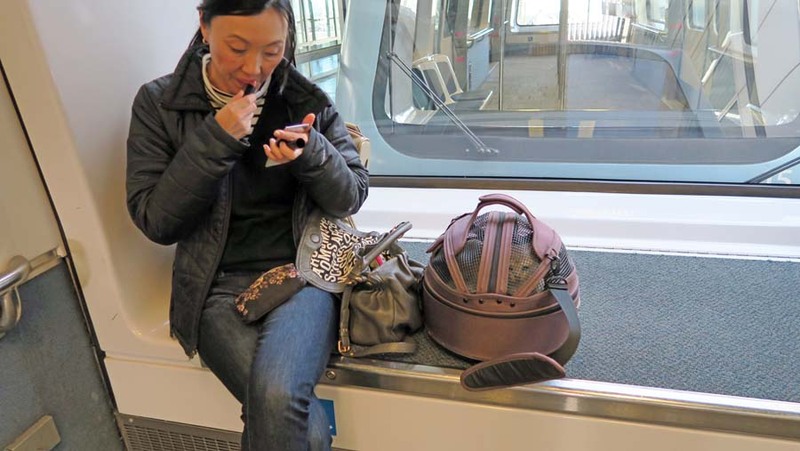 AND.... 12 hours after we depart, here we are back in the SFO Air Train with the kittens. And finally back to our home in California. On the left below is Cooper and on the right is Bentley in their new home, they already found the cat tree. The blue cage is temporary, it is to keep the kittens nice and safe and give them a big play area while they get used to our older Singapura named Pixie, and a Papillon dog named Chou Chou. 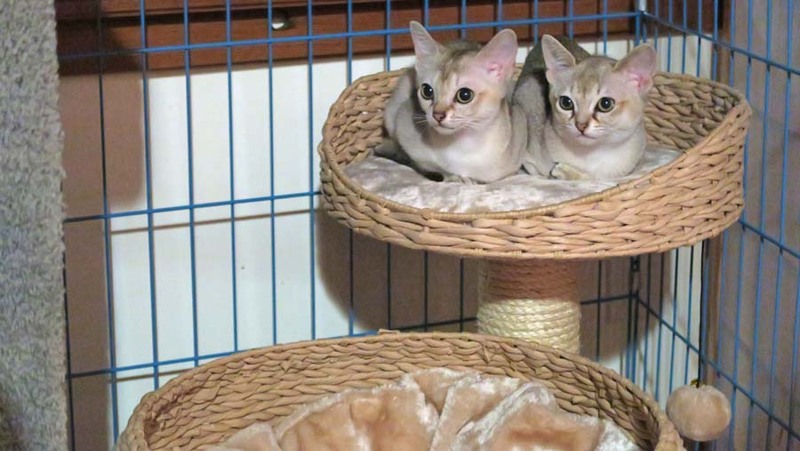 Click the movie below to play a movie of cute Singapura kittens playing! Click here for a super large "original" version. 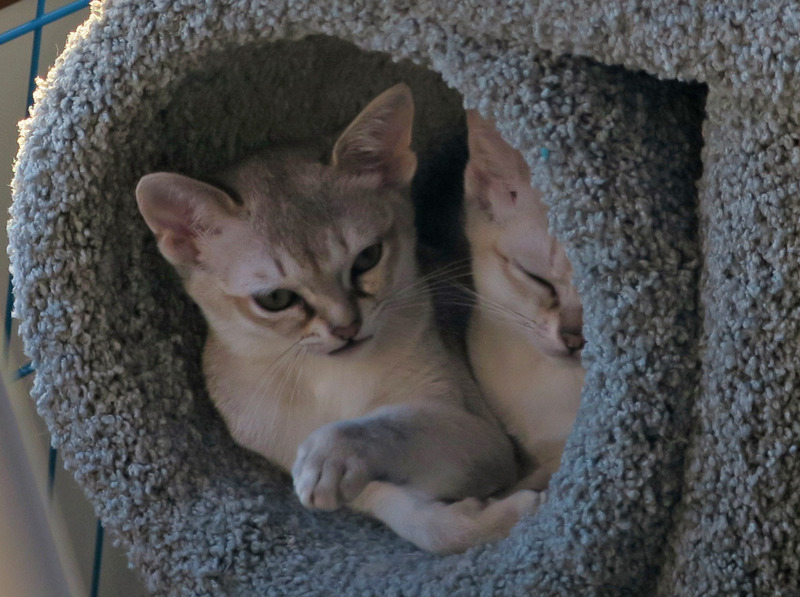 There is a carpeted tunnel in the small cat tree, and Cooper and Bentley enjoy cuddling together and sleeping in the tunnel. 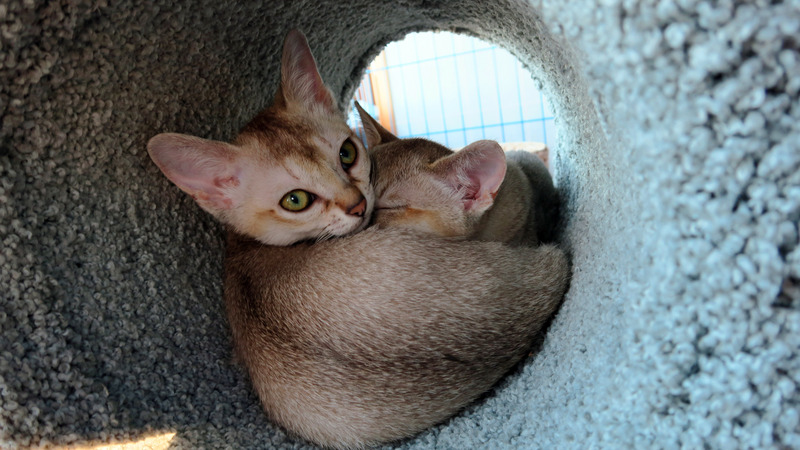 Below is a close up of the Singapura Kittens cuddling in the carpet tunnel. 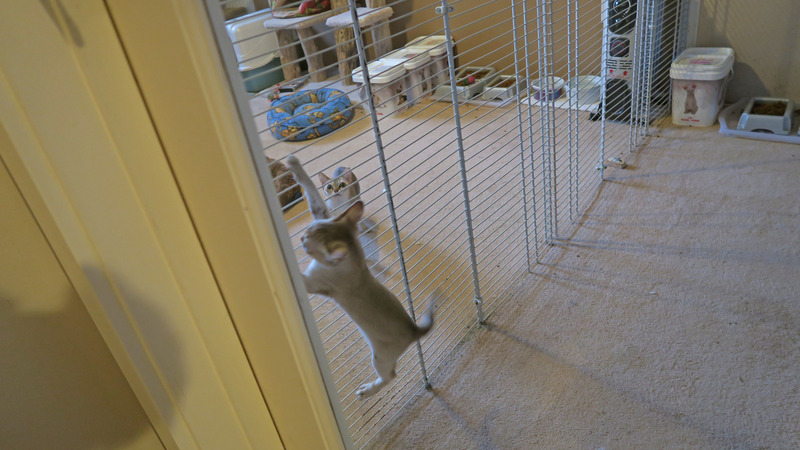 The kittens IMMEDIATELY began climbing the cage walls, and I had to jury rig a blue tarp firmly over the top of the enclosure to prevent them from escaping. Below you can see Bentley climbing the blue cage walls like a monkey. Click the movie below to play a movie of cute Kitty-Monkeys! Click here for a super large "original" version. It is pretty cute to watch them climb the walls. 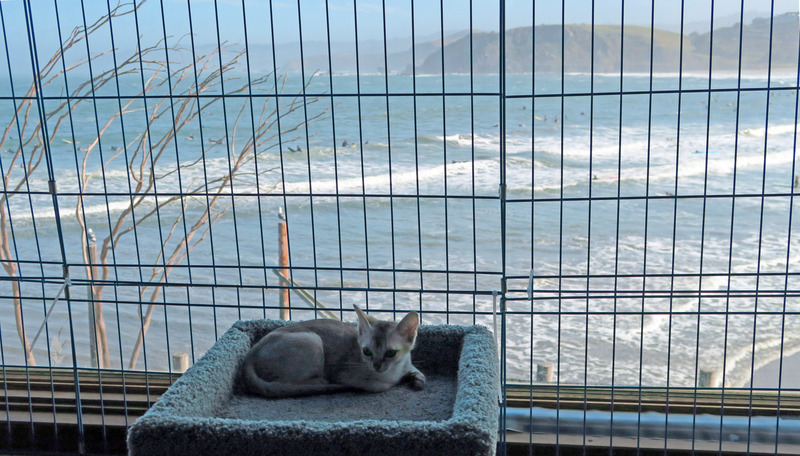 We live by the ocean in Pacifica, California, you can see some waves and surfers in the background. Kitty-Monkeys climbing up the walls. The picture below is Cooper, hanging out by the ocean. On the left is Bentley and on the right is Cooper. 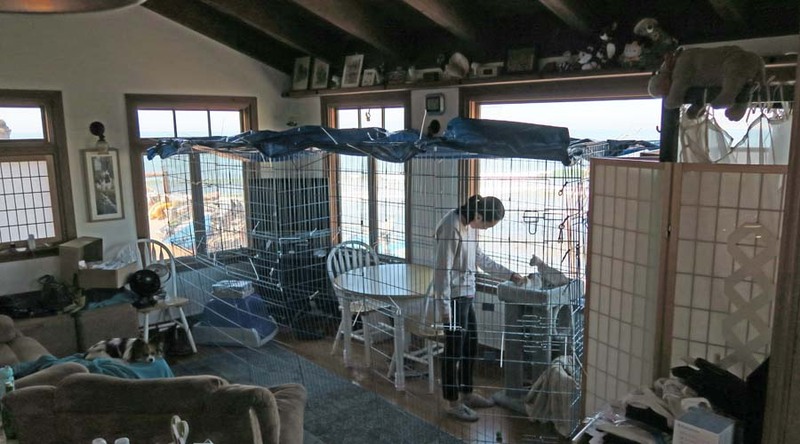 In the picture below you can see the entire jury rigged "cage" we setup so the kittens can be nice and safe and the former residents (dog and older cat) can get used to the new kittens. 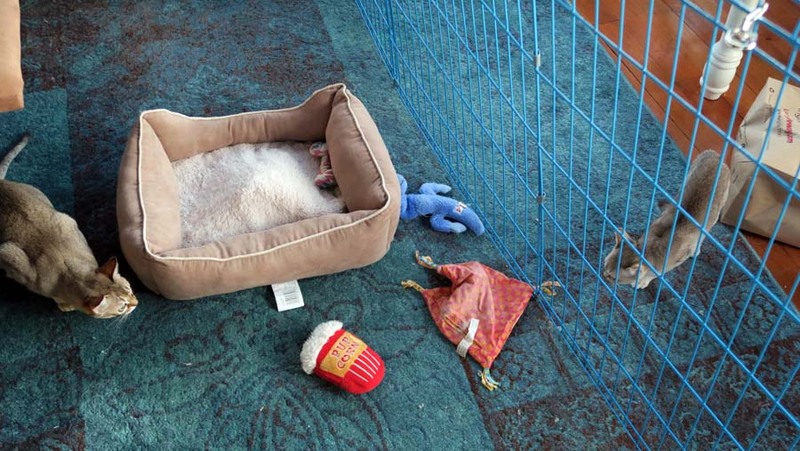 You can see the Papillon dog named "Chou Chou" on the left of the picture on a green blanket. I had to add the really ugly blue tarp because of the cats climbing out of the fenced area (the whole "kitty-monkey" problem). 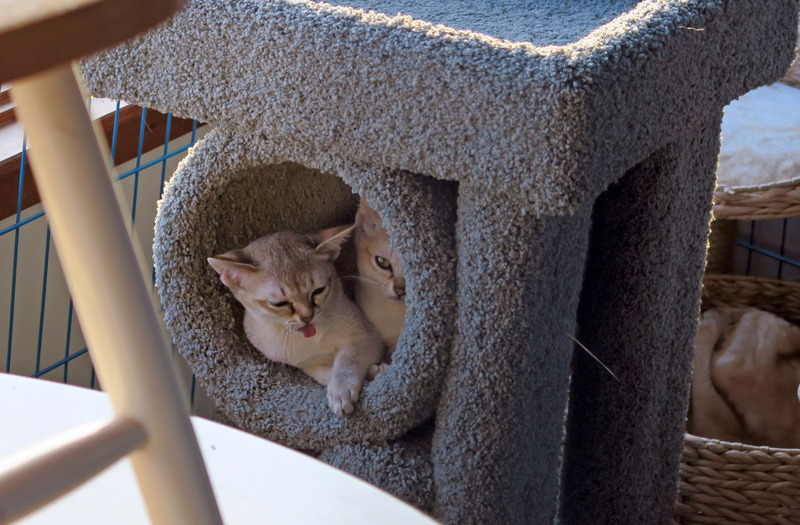 In the picture below the kitten is being a derp. 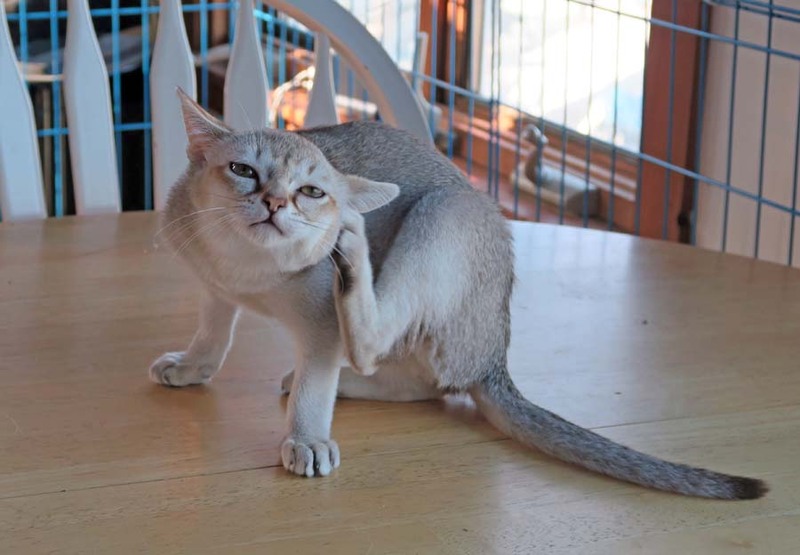 Bentley has itchy ears because he had some waxy buildup in his ears. The vet cleaned out his ears the following day. I think this is Cooper in the carpeted tunnel. A Singapura Kitten in a carpeted tunnel. Katherine holding Bentley while inside the cat enclosure at our dining room table. 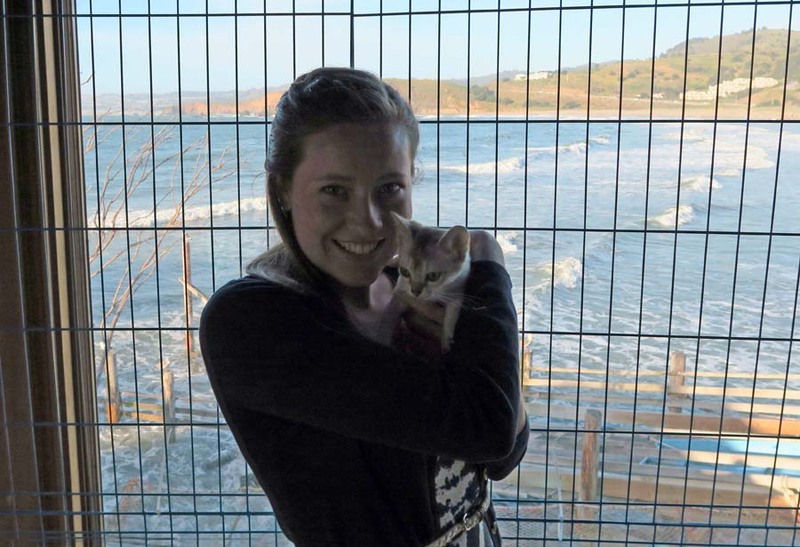 A close up of Katherine holding the Singapura kitten. Katherine holding Bentley and Cooper comes up to see both of them. Bentley with his eyes open, Cooper snuggling with his half brother asleep in the carpet tunnel. Ari Echt-Wilson came by to play with the kittens. 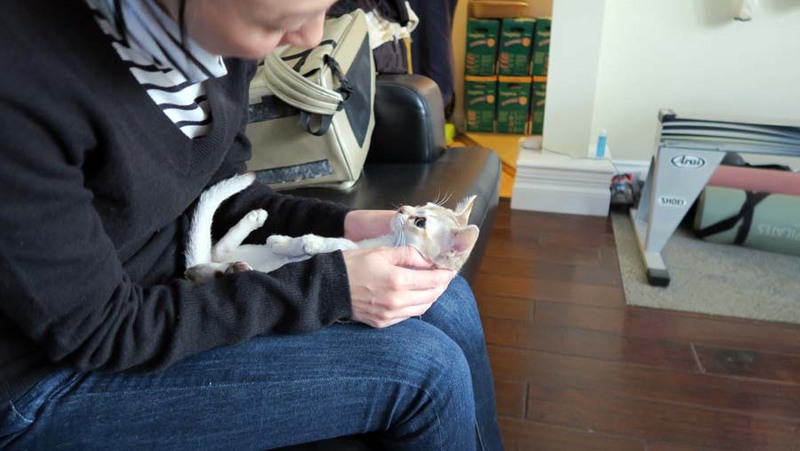 Here is Ari holding Bentley the Singapura kitten. 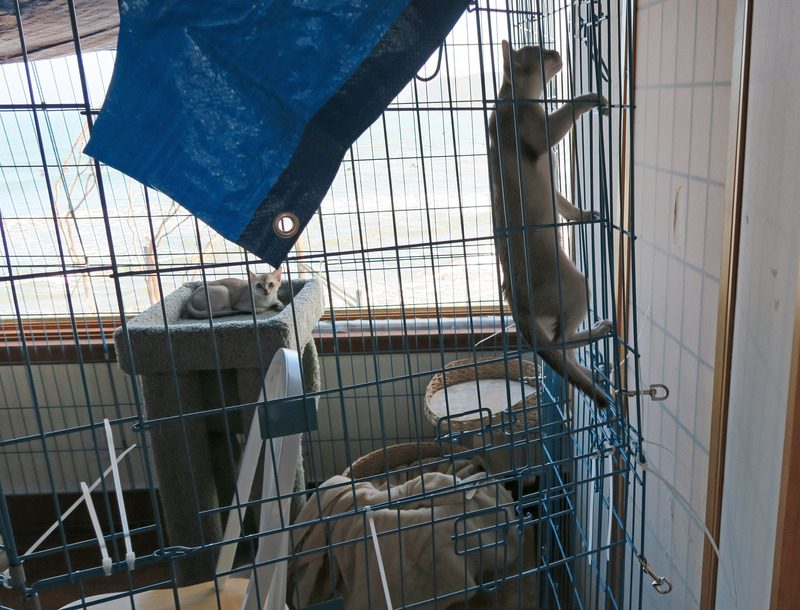 On the left is our 3 1/2 year old Singapura named "Pixie" staring at Bentley on the right who is inside the blue cage. They are getting used to one another. The morning of 3/29/2015 (Sunday) we took the two kittens to the vet for a "wellness visit" and to get them electronically chipped. 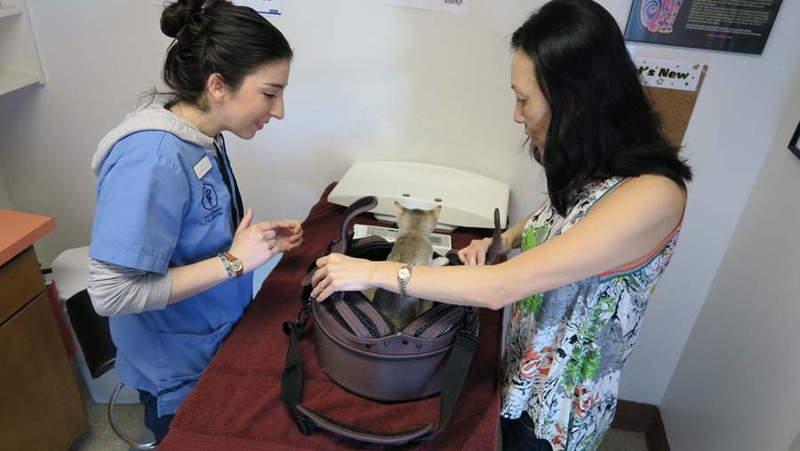 The vet tech in blue below is smiling at the adorable kittens. Bentley weighed in at 3 pounds and 3 1/2 ounces. 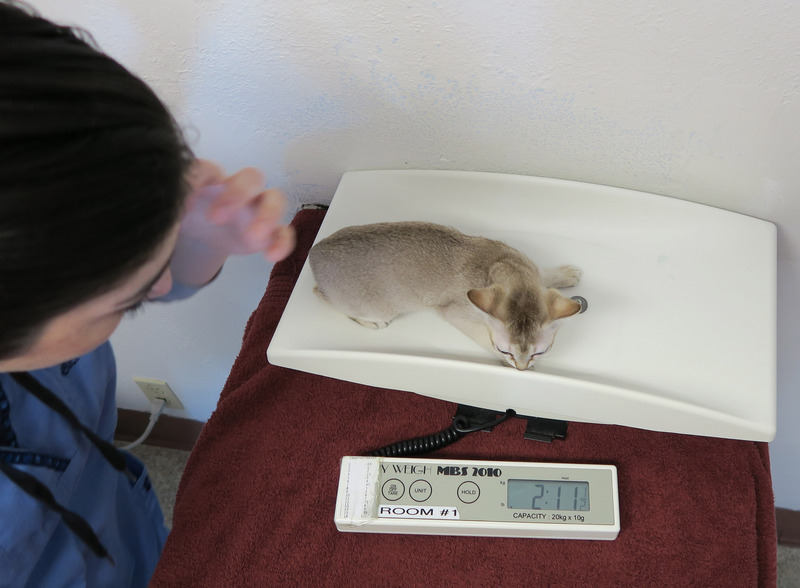 Cooper weighed in at 2 pounds and 11 1/2 ounces.